Find Residence Inn By Marriott Pentagon City deals, discounts and special offers. Close to DC attractions, this 299-suite hotel features an indoor pool and on-site fitness center. This AAA Three-Diamond and Mobil Four-Star luxury hotel overlooks the Potomac and Washington, DC. Newly-renovated hotel offering airport shuttles, award-winning dining, and a convenient location. A full-service hotel located near major tourist and business destinations. Luxury hotel features indoor & outdoor pools. Guests can also enjoy tapas at bin1700. 333-room hotel features contemporary décor, an indoor pool and casual dining at CC Bistro. Close to D.C. tourist attractions, this all-suite hotel offers spacious comfortable rooms and a friendly staff. Friendly staff and comfortable accommodations await guests. Enjoy indoor & outdoor pools and dining at Revival. Near DC tourist attractions, this hotels features a lap pool and on-site fitness center. 272-room hotel offers guests comfortable accommodations, an indoor pool and dining at The Grille. This hotel features waterfront views, fitness center access and a complimentary evening wine reception. Located near Washington D.C., this hotel features high speed internet, heated rooftop swimming pool, and fine dining. This hotel features a fitness center, saunas, and complimentary high-speed Internet access. 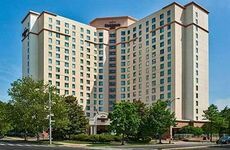 217 room located 1 mile from Ronald Reagan National Airport and right next to the metro station. Luxury hotel in Arlington, convenient to the Rossyln Metro station.